( September 21, 2013, Chennai, Sri Lanka Guardian) The present state of the Indian economy, the falling value of rupee and drop in industrial production and manufacturing buildup clearly point out that Manmohan Singh's government has not been able to deliver the goods. Obviously , it is not going to do any better than what it has in the past nine years. This scenario calls for a change in the leadership, policies and approach of government of India , which means that those in charge of the government of India at present should vacate. It is absolutely necessary now that the leadership of the central government should be vested with a person who has demonstrated convincingly administrative capability with economic and industrial development agenda. Of all the Chief Ministers in India today, Narendra Modi is the only one who has shown such qualities by his stellar performance in Gujarat for over 12 continuous years, which is there for all to see. The freebie culture of offering free goods and services to people in the name of supporting the poor has done incalculable harm to the national economy. And destroying the work culture. What poor people need is skills and sustained job opportunities. Crores of rupees of money have been invested and proposed to be invested by way of food bill, MNREGA, where people have been given jobs, work and wages without linking productivity and output to the funds invested. Apart from the central government, several state governments such as Tamil Nadu are also guilty of resorting to such gimmicks to gain cheap popularity and corner the votes. Narendra Modi is the only chief minister who has not resorted to such measures and still won three consecutive elections in Gujarat convincingly. India today desperately needs self confidence and motivation, almost similar to what Swami Vivekananda injected into the national psyche around 100 years back. Certainly by his talks and actions and futuristic vision , Narendra Modi is showing glimpses of his capability to energise and motivate the countrymen to reach higher targets. India today needs a Chief Executive like Prime Minister and not a politicking or submissive Prime Minister. After seeing the performance of Manmohan Singh for the last nine years during which period he has been subjected to a high level of ridicule, particularly in the media for his unwillingness to communicate with his people, subservient attitude to the President of his party and tolerant approach to corruption,it is crystal clear that Narendra Modi definitely represents a different spirit, that reflect probity in public life and a strong character with almost a missionary zeal to achieve set targets. 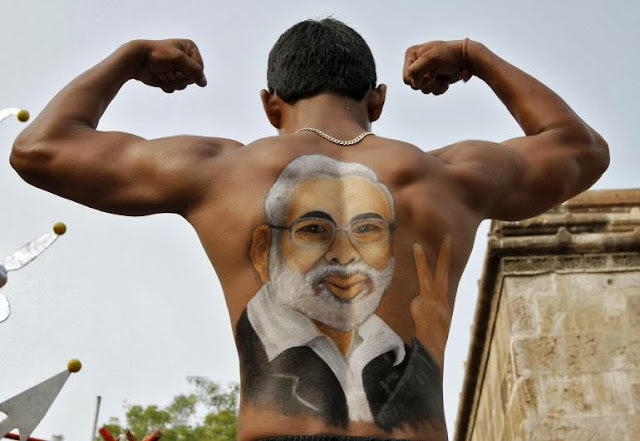 In these aspects, certainly no other political leader in view in India today matches Narendra Modi. The criticism against Modi that he will polarise the people on the basis of religion and caste is absolutely not true and is certainly motivated propoganda by those who have no weapon now to criticise Modi on other fronts. The fact that there have been no communal riots in Gujarat after 2002 would more than prove this point. Modi has repeatedly and clearly said that he stands for India first, which by its structure has to be all inclusive. Today, communalism is brought to national forum by the so called secular forces and not by Narendra Modi In this aspect, Modi is sinned against rather than sinning.